The Mane-ly Long Hair Detangler Polisher Protector helps maintain healthy hair, while protecting it from the elements. Long Lasting formula that strengthens new hair growth while preventing breakage and dryness. This easy to use, leave-in formula adds shine and makes grooming fast and easy. This Polisher is not greasy, leaves no residue, repels dust and dirt, keeps hair soft, silky and tangle free. Formulated with Keratin Amino Acids, Panthenol and Layered water and non water soluble silicones, (no alcohol added). Use all year round. Safe to use on horses, dogs, and people too! Apply a generous amount evenly to wet or dry hair. Brush through gently starting at ends, working inch by inch up to roots, to prevent breakage and allowing the hair to remain long.LEAVE IN! Reapply as needed. If difficult brushing, add more until it's easy to brush. Apply a few drops to matted/tangled fur. De-tangle, de-matt with your fingers. Remove excess with a towel. Apply after bath to prevent. Reapply as needed. Apply a few drops and distribute through wet or dry hair before brushing. Do not apply to roots. 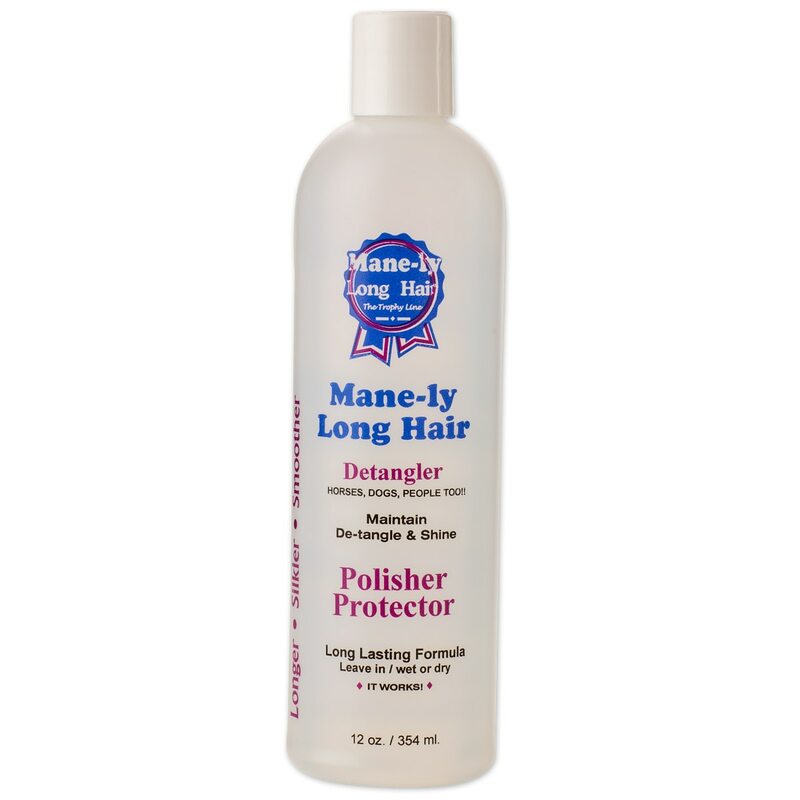 Mane-ly Long Hair Detangler Polisher Protector is rated 5.0 out of 5 by 12. Rated 5 out of 5 by Akpitts from Love this Detangler I have been using this detangler for years. I rotate between this and the equifuse gleam. They are the best products on the market for friesian hair! I am so happy smartpak is finally carrying both! Manely long leaves the hair hydrated and silky for days and you only need to use about a dime to quarter sized amount. Rated 5 out of 5 by Hma23 from Detangles and Streathens I love this product! I have been using it for over a year now to keep my mare mane and tail strong and tangle free. It product helps get wind knots out of manes, removes burs from trail riding and keeps the hair healthier. I will always have a bottle in my grooming tote. Rated 5 out of 5 by Robin61 from Great ingredients I have been trying a few different mane products and this one I found to be the best...Really works in detangling and lasts as well. I'll definitely buy again! Rated 5 out of 5 by JoenJane from THE best detangler out there, by far. I’ve used one product for years and thought it did a great job - that was until a friend shared her bottle of Mane-ly with me. SO much more bang for your buck. I use less, it applies easily and evenly, smells wonderful, and lasts longer than what I’ve been using. I’m won over. The riders at the barn who show heard I was using a new detangler and have been taking pictures of the bottle so they can buy it too. Rated 5 out of 5 by Susannah from Must have this in the barn. This unique product does exactly what the manufacturer claims it will do. I have been using it for several years, after finding it at a horse expo, and speaking directly with the company's owner. She is a trail blazer for equine grooming aids. This product is absolutely amazing, and I can't be without it ever again. I have told all my horse buddies, and even bought some to give as gifts to get people started on it. They all love it!!! Thank you to everyone at Mane-ly Long Hair!!!! Rated 5 out of 5 by Tiffany G from Love Manely Long Products! I habe been using Manely Long products on my horses for over 2 years and wouldn't use anything else! My horse has a ton of white. The shampoo gets him very clean and the use of the conditioner (diluted as Hydrate 24) and deranged keep him so shiny people say he is to bright to look at in the Sun! I strongly recommend these products and was ecstatic when SmartPak started to carry them! They last a really long time and is very cost effective. Rated 5 out of 5 by Cheryl from Really works! I have used this before and keep it on hand for those spa days with my horses when I really need a great de-tangler. Try it! Rated 5 out of 5 by lanae from Best on the market! This product is what got me hooked on Mane-ly Long Hair products! Literally nothing exists like it! It keeps hair detanged, protects from breakage, moisturizes, and repels dirt. It’s a must for long manes and tails! My horse’s locks look and feel amazing after using the Polisher! A little goes a long way and it lasts! Rated 5 out of 5 by momito from The BEST! I am so happy smartpak is carrying this now! This is the best detangler I have ever used. Doesn't attract dirt or dust. No sticky residue. Tail stays clean and soft longer. Love it! Rated 5 out of 5 by Greyhorseowner from The best detangler and protector! Safe for hair - won’t cause breakage or dry it out. Once you use it you will never go back to any other product! The hydrate 24 mix to moisturize is excellent - add detangler polisher on top.